Remind me to never complain about a little cold or snow again. Nothing like an EF-4 tornado hitting a major metropolitan area to put things into stark perspective. In spite a warming Earth there's no conclusive, scientific evidence that we're seeing more violent tornadoes. There's more water vapor and instability to fuel severe storms, but in a warming world wind shear necessary for violent tornadoes should decrease over time. More research is needed, but I suspect the real culprit here is land use - suburban sprawl. 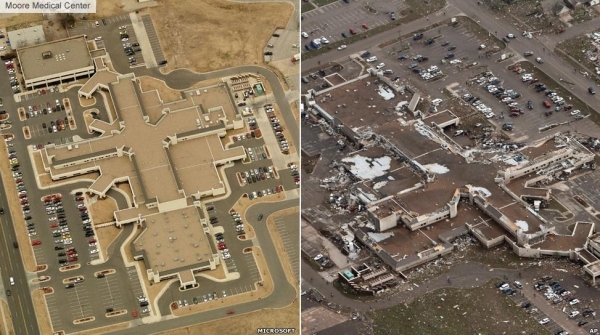 The same monster tornado that hit farmland 20 years ago is now grinding into subdivisions and shopping malls. Doppler radar can't always estimate the intensity of a developing tornado, and as a nation we suffer from tornado fatigue: too many warnings. Out of 10 tornado warnings only 3 will produce a tornado, and the ones that form are usually small and brief. This breeds apathy and cynicism, so when the big one, the nightmare ("Tornado Emergency") becomes reality - people are skeptical. Review a Tornado Action Plan with your kids. Information is power. A cool, wet Wednesday gives way to a partly sunny, lukewarm holiday weekend. As temperatures rise next week so will the risk of severe storms. In the words of the Boy Scouts: "be prepared". The Tornado Outbreak Of May 20, 2013. Here's the very latest from the National Weather Service in Norman, Oklahoma: "Damage survey teams are continue to survey the damage path of the Newcastle-Moore tornado that occurred on May 20, 2013. We will be adding more information to web pages for this event during the next few days. Note: As of 2:50 PM CDT, the NWS survey conducted by several teams has now rated the Newcastle-Moore tornado as EF-5. The damage survey teams have also determined that the tornado began 4.4 miles west of Newcastle and ended 4.8 miles east of Moore, yielding an approximate tornado path length of 17 miles. The preliminary maximum damage path width is 1.3 miles. Crews will continue to sort through damage for a final intensity rating. The latest Public Information Statement issued by the NWS Norman forecast office can be found here. Further updates and more detailed information of the tornado damage areas will be released later today and Wednesday. 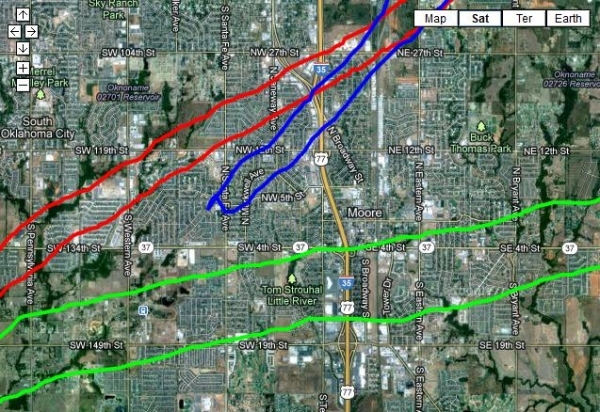 Below is a map with the approximate damage path of the Newcastle-Moore-South OKC tornado." A rating of EF-5 has been given to the tornado that affected the Newcastle, south OKC, and Moore areas in McClain and Cleveland Counties. The tornado had.a path length of approximately 17 miles and was on the ground for approximately 40 minutes from 2:56 PM - 3.26 PM CDT. The preliminary maximum path width is 1.3 miles. 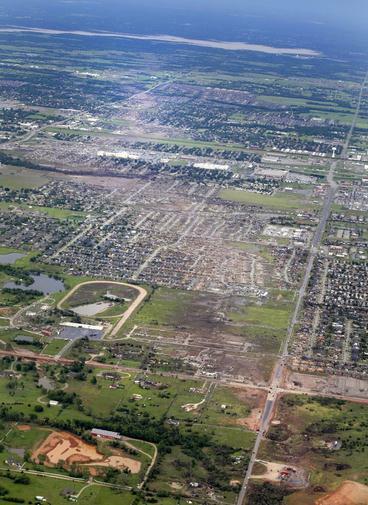 Photo credit above: "This Tuesday, May 21, 2013 aerial photo shows a residential area of Moore, Okla. destroyed by Monday's tornado. A huge tornado roared through the Oklahoma City suburb Monday, flattening entire neighborhoods and destroying an elementary school with a direct blow as children and teachers huddled against winds." (AP Photo/Tony Gutierrez). 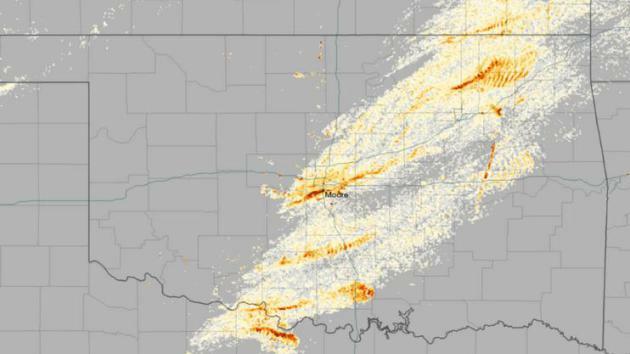 Tornado Tracks Streak Across Oklahoma. Here's an excerpt from NOAA's Environmental Visualization Laboratory: "The rotation of tornadoes creates a distinctive signature in radar data, and can be used to estimate the track that the system takes over land. This image shows the rotational velocity of the systems that passed over Oklahoma on the afternoon of May 20, 2013. 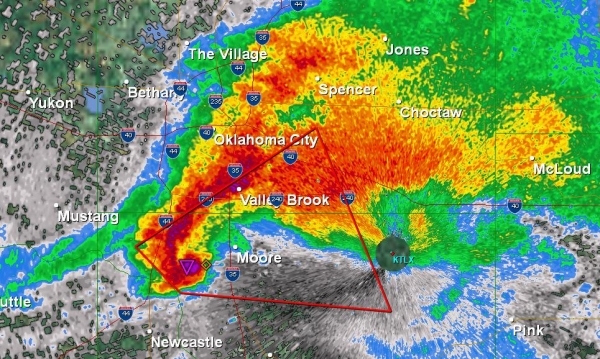 A single cohesive structure can be seen to cut across seven counties, with Moore directly in the middle..."
Our Worst Fear Confirmed: A Violent (Urban) Tornado. The tornado that formed west of Moore, Oklahoma yesterday went from EF-1 to EF-5 strength within 10-15 minutes, responding to favorable conditions aloft (powerful wind shear coupled with an explosively unstable atmosphere). Tornado Watches were posted roughly 2 hours ahead of time, Tornado Warnings issued by the OKC NWS at least 30 minutes in advance. The problem? If you don't have a basement or underground shelter the odds of surviving a direct hit from an EF-4 or EF-5 are small - even well constructed brick and mortar homes can be scraped down to foundation by an EF-5's 200+ mph winds. * Death toll stands at 24, although I expect this to go up as recovery efforts continue today. Hundreds are injured; many residents still missing. As many as 20,000 residents of Moore may be homeless. * 30 square miles impacted by moderate to extensive tornado damage. 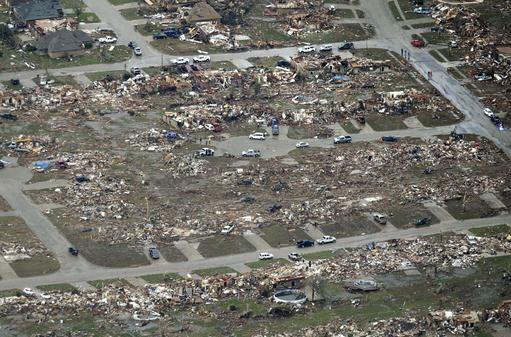 * This may top Joplin as the most expensive tornado in U.S. history. 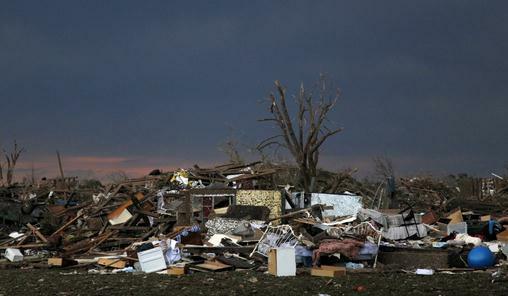 The May, 2011 Joplin tornado came in at $2.8 billion. 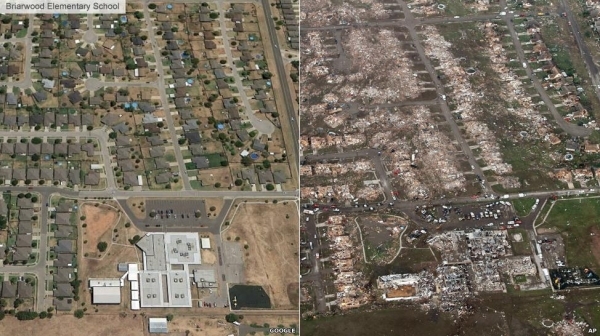 I expect the 2013 Moore tornado to be comparable, probably $2-3 billion in total damage. 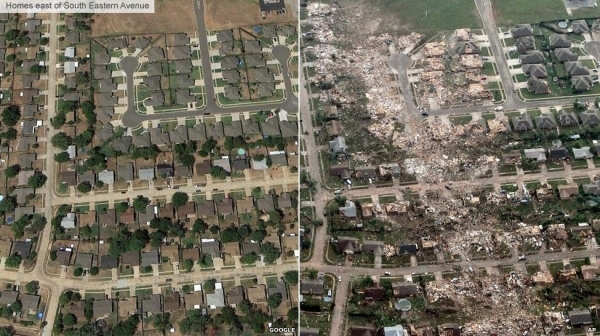 There's a good chance this will be America's most expensive tornado on record. Moore Damage Path. 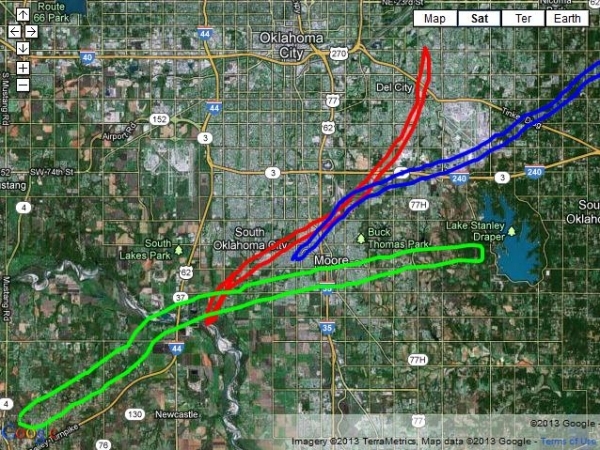 Yesterday's mile-wide path is in green, the 1999 EF-5 path is in red, the 2003 tornado in blue. KFOR.com has a good interactive map here. Close-Up Of Damage Path. Again, the green-shaded area shows yesterday's track, a wider path than 1999 and 2003. 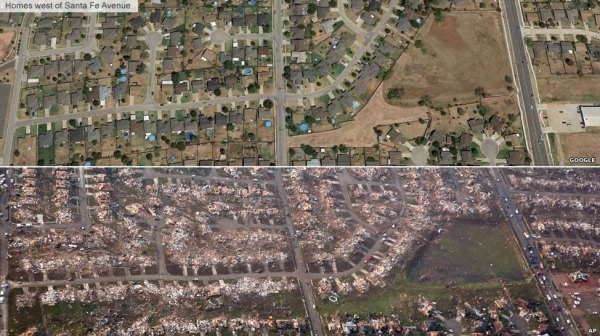 Thousands of homes and businesses were impacted. Fewer than 1 in 10 Oklahomans have basements or storm shelters - bedrock makes it costly to excavate. Some have storm shelters, steel and concrete-reinforced closets and garages, but an EF-4 can be unsurvivable if you can't get below grade, below ground. Ground Zero. Here is an aerial map with path superimposed, showing where some of the most destructive (and deadly) winds hit, including Plaza Towers Elementary School, where loss of life was high. Photo credit: BBC, AP, Google. Plaza Towers Elementary School. The before/after imagery is stark. This tornado will reignite the debate over school safety and the need for reinforced shelters in all public buildings. Photo credit: AP. Moore Medical Center. Damage is significant at Moore Medical Center; most operations have been shifted to other nearby medical facilities. Photo credit: AP. War Zone. As meteorologists we're trained to think clinically, like doctors. Look at the data, evaluate the models, make a prediction. Leave emotion out of the mix. But you can't look at these images (as a parent, as a human being) without being heartbroken. The damage is consistent with an EF-4 or EF-5 tornado. Photo credit: AP. More Imagery. Here is a before/after comparison of homes in a neighborhood east of South Eastern Avenue. * before the tornado hit several Oklahoma City TV meteorologists encouraged people in the direct path of this tornado to "drive away". The reality: if an EF-4 strength tornado is approaching and you don't have a basement or shelter your odds of survival are small. Statistically it's better to get into your vehicle and try to outrun the tornado. The problem: as good as Doppler radar is it can be difficult estimating the intensity of a tornado, even 10-15 minutes in advance. We can see rotation, even a hook echo, but is it an EF-1 or a monster EF-5? Unlike hurricanes, where we can see satellite imagery and estimate strength, tornadoes are much more difficult to predict in advance: track and ultimate intensity. * there is no evidence that we're seeing more EF-4 or EF-5 tornadoes, which comprise less than 1-2% of ALL tornadoes that strike the USA. A warmer atmosphere increases instability and buoyancy, but wind shear in a warming world should decrease over time. More research is needed, but we can't (yet) connect the dots and claim that there is causal connection. More research is needed. Wednesday Risk. No moderate threat tomorrow, a slight risk of storms capable of hail and damaging straight-line winds from Detroit, Columbus and Cleveland to Pittsburg, State College, Buffalo and Rochester. An isolated tornado can't be ruled out in and near this region tomorrow, but probably not the scope and severity of the tornadoes that have struck the Southern Plains in recent days. Summary: It's our worst fear as meteorologists: a large (urban) tornado. One glaring problem: "tornado fatigue". As a nation we are still issuing too many tornado warnings (at least that's the consensus among most private meteorologists I know). Nobody wants to miss a tornado - that's the cardinal sin, so NWS issues warnings on just about every rotating thunderstorm they find on Doppler. The FAR or false alarm rate is still hovering near 70%. Stated differently, 7 in 10 tornado warnings produce NO tornado. This leads to apathy ("they're crying wolf!") and when the big tornado does materalize, when our worst fears are realized, many residents simply aren't ready to take the measures necessary to protect their lives. In a hurricane you have days to prepare; a tornado: 5-30 minutes. The average lead time, nationally, is 13-15 minutes. Last year I proposed new terminnology, leveraging "Alerts" (for rotation based storms) and "Tornado Emergencies" (for confirmed tornadoes on the ground moving into urban areas). This is a reflection of land-use trends and suburban sprawl. Tornadoes that would have hit farmland 10-30 years ago are now hitting subdivisions. As metropolitan areas expand the probability of a direct strike from major tornadoes goes up steadily over time. Last year I wrote an article for Huffington Post, recounting a severe storm conference, where a well-respected structural engineer/meteorologist predicted that, within our lifetime, a single U.S. tornado will hit an urban area, even a downtown, with over 1,000 fatalities from a single twister. Yesterday was a reminder (to me) that his prediction may not be as far-fetched as it sounds. It's land-use, statistics and probabilities, another unpleasant symptom of expanding metropolitan areas. A Survival Plan For America's Tornado Danger Zone. Here's an excerpt of a timely story from The New York Times: "The horror confronting residents and emergency workers probing the tornado wreckage in Oklahoma is unimaginable for those of use elsewhere. Collapsed schools, disintegrated homes, crushed cars and more. The main focus should be on aid. But it’s worth beginning a conversation about ways to live safer in such hazard zones given that this storm season is just getting under way and that big regions of America’s tornado hot zone have deep vulnerability resulting from runaway growth and a human tendency to discount threats that have a low probability but disastrous potential. 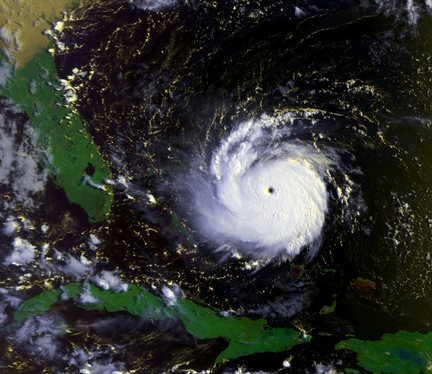 (The same issues are driving exposure to danger in hurricane zones.)..." What Happens When The TV Meteorologist Has To Take Cover? I've wondered this many times myself: "what happens if the tornado approaches the TV station?" Go down with the ship? Here's a clip from NBC News and mashable.com: "A massive storm generated several tornadoes on Sunday in the Midwest, hitting Kansas, Oklahoma and Missouri. 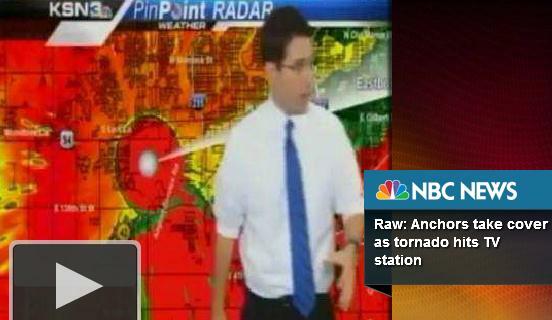 The tornado in Kansas got so bad that news station staff at the NBC affiliate TV station in Wichita, Kan. had to leave in the middle of a live broadcast to take cover. In the dramatic video, the channel's meteorologist JD Rudd is talking about the extreme weather in front of a radar image of the storm when, after a few seconds, producers tells him it's time to leave..."
Hurricane Season Comes With Plan For Better Forecast. This story comes as something of a relief; I'm sick of talking about the ECMWF (European) weather model. It's time for the U.S. to step on the gas and retake the lead in weather modeling. Here's an excerpt of a Jason Samenow article at The Washington Post: "...The summer and fall hold the possibility of big storms but also steps toward better forecasts. An infusion of Sandy-related dollars from Congress will help the National Weather Service upgrade two supercomputers that are used in virtually all U.S. weather predictions. That, in turn, could close what some have called an embarrassing gap between the primary U.S. and European computer models. The European model has generally been more adept at forecasting the paths and intensities of major storms, and that pattern held in October when the it projected the lethal westward turn by Sandy even as the early U.S. model showed it drifting to the east harmlessly, toward open ocean..."
Tropical Whispers. The GFS forecast, valid midday Wednesday, June 5 shows a possible tropical depression or weak tropical storm approaching south Florida. 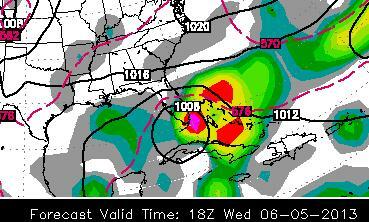 Confidence level: very low, but the models continue to hint at development in the tropics. We'll keep an eye on what may evolve into "Andrea". Image: WSI. Sluggish Warming Trend. As much as I want 80s (like many of you), I'm starting to dread the warm fronts just a little, in light of the recent uptick in severe storms and tornadoes. After a very slow start tornado season is upon us, the weather we should have seen 2-4 weeks ago. Everything has been delayed, including (sustained) summer heat. A rainy day today gives way to comfortable sunshine tomorrow, more showers Friday night, and then a drying trend over the weekend. Memorial Day appears to be the warmest day of the holiday weekend, temperatures warming to or above 80 by the latter half of next week. A Less Optimistic Holiday Weekend Prediction. I'm basing a partly sunny, dry Sunday and Monday primarily on ECMWF model data, but the GFS solution (above) is definitely wetter for Minnesota and the Upper Midwest Sunday and Memorial Day, especially southern Minnesota. I'm not buying this solution just yet, but it is a holiday (with high "bust potential"), so I'm not ruling it out either. What can go wrong, and what time? Will Summer Stick This Time? I think so, but considering how erratic the jet stream has been this "spring" it's anyone's guess. GFS data shows highs reaching the 80s by the end of next week, a longer stretch of 80s to near 90F. the first week of June. We'll see. Welcome To The Programmable World. When all our devices start talking to each other, watch out. I keep picturing The Terminator coming from the future to save us from ourselves. Connected, programmable devices are already here, and the trends are undeniable, as described in this terrific article at Wired; here's an excerpt: "...In this future, the intelligence once locked in our devices now flows into the universe of physical objects. Technologists have struggled to name this emerging phenomenon. Some have called it the Internet of Things or the Internet of Everything or the Industrial Internet—despite the fact that most of these devices aren’t actually on the Internet directly but instead communicate through simple wireless protocols. Other observers, paying homage to the stripped-down tech embedded in so many smart devices, are calling it the Sensor Revolution. 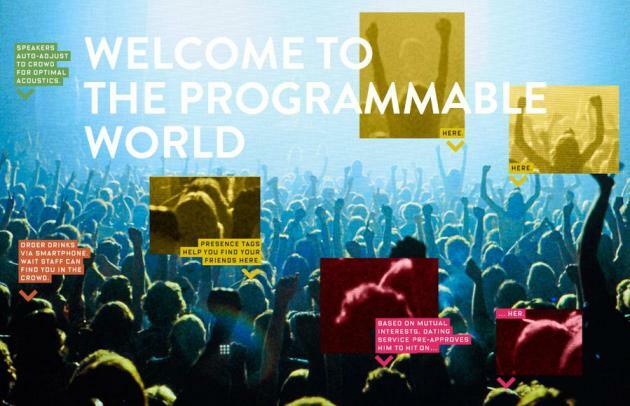 But here’s a better way to think about what we’re building: It’s the Programmable World. After all, what’s remarkable about this future isn’t the sensors, nor is it that all our sensors and objects and devices are linked together. It’s the fact that once we get enough of these objects onto our networks, they’re no longer one-off novelties or data sources but instead become a coherent system, a vast ensemble that can be choreographed, a body that can dance..."
65 F. high in the Twin Cities Tuesday. 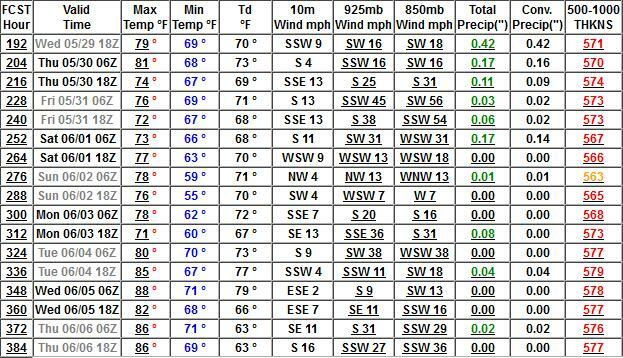 71 F. average high for May 21. 74 F. high on May 21, 2012. .38" rain fell yesterday at Twin Cities International Airport. Relapse. 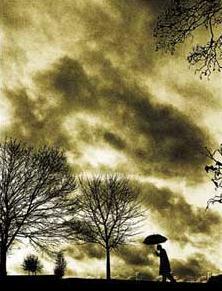 Yesterday was an acquired taste, weatherwise, cool, misty and gray. Don't complain about the chill, Paul. Got it. I'm talking to myself in print - not a good sign. Tuesday highs ranged from a brisk 46 at International Falls to 50 St. Cloud and 65 in the Twin Cities. Are There More Tornadoes Because Of Global Warming? The short answer is "probably not", but the data set is somewhat unreliable (plenty of noise in the data). Increases in water vapor and instability in a warming world MAY be at least partially offset by a decrease in wind shear (as northern latitudes warm faster than southern laitudes), but the research is still preliminary. Dry areas are getting drier, wet areas wetter, with a causal connection to spikes in flooding rains and even hurricane intensity. But the link with (severe) tornadoes is not obvious, at least not yet. Minnesota climate scientist Greg Laden has more in this comprehensive post at scienceblogs.com: "There are good reasons to believe that global warming leads to more storminess, but the exact nature of that transition is unclear and hard to measure. 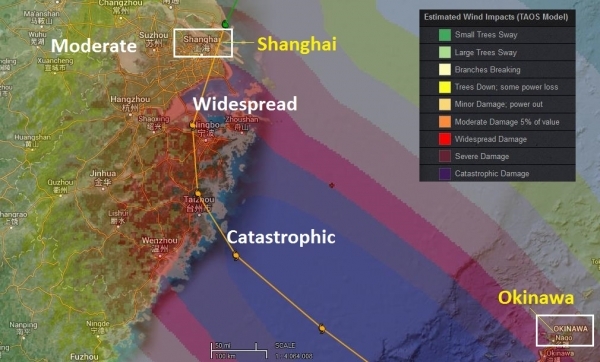 Part of the reason for this difficulty is that a given type of storm may become more likely under certain conditions caused by climate change, while a different kind of storm may become less likely, with the “storminess” overall increasing but doing so indifferent ways across time. Also, the most severe, and thus possibly the most important, weather events are infrequent so it is difficult to see changes over time with any statistical confidence. 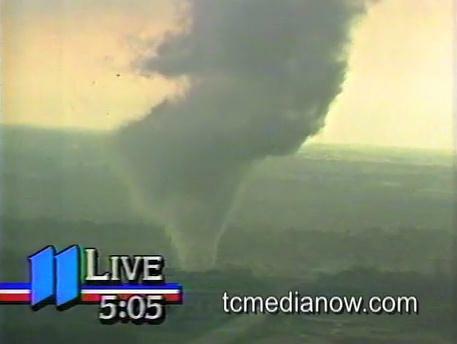 I address many of these issues here and here..."
Image credit: this frame-grab from the 1986 Brooklyn Park, Springbrook Nature Center tornado courtesy of KARE-11 and tcmedia.com.